Evo 1/2/3 Brembo big brake kit from £599! I'm currently running a special offer on the Porsche/Brembo big brake kit I sell. The usual price for the kit is £700 (including the hoses, £675 without) but for a limited time I'm offering this for £629.00. A saving of over £70! What's more, if I can secure 3 orders together, I will reduce this price down to £599.00!!! a saving of over £100 over the standard kit. This brake kit uses calipers supplied by Brembo, and are without a logo stuck on them, so you can fit whatever transfers on them you see fit. They are Brembo calipers without the Brembo logo. They use the same pistons, the same seals, the same pads as rebadged Porsche calipers as used on many models. This kit has been fitted to several cars and all feedback has been fantastic. All prices above are plus shipping, but if you're anywhere local to me we can meet up and do the swap. Everything you need to bolt the kit to the car is included, and you shouldn't have to modify anything to fit. man...I should have held out for this kit...Ohh well, pretty happy with the 294 disk/wilwood 4 piston caliper kit. Good products! 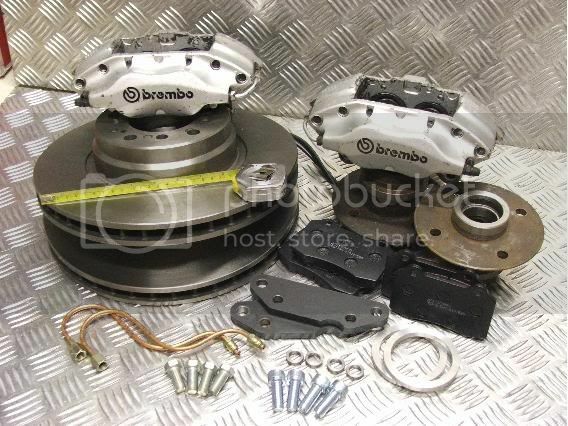 those discs are small for a porsche set up arent they are these the brembos off the fiat coupe instead ?? The calipers are definately supplied as replacements to Porsche calipers. The disks supplied are 316x28 single piece piece disks as they're available at a good price. I can supply larger if they're required. unless of course there are 2 versions available? The Fiat Coupe Brembo caliper uses a 304x28mm caliper with a pad size of 110x69.3mm. These calipers in the kit above use the same pads as used by the Evo Brembo caliper and will take anything from a 225>355mm disk and with a pad size of 132x77mm. Most of the Porsche Brembo setups use anything from a 298x28mm disk (911(964), 944, Boxter (only a 24mm thick disk) a 304x28mm disk (911(993), 928, 944) or the more recent ones use a 318x28 disk on the 911(996) and newer Boxters. The only ones bigger are the Cayenne which run a 350x34mm disk. That isn't including any customer specified upgrade, carbon disks or other variations. Do you do anything to fit under 16" wheels with these kits, also allround front and rear kit??? The dynalites would fit under some 16" wheels depending on the style of them. What did you want to do with the rears? There's not a lot of call for it when prior find out they cost more than the fronts! Has the Evo got integral drums like the 5> or integral handbrake like the FTO? Same as FTO i think with handbrake is on the caliper. Wilwood do a 4 pot radial mount caliper with integral handbrake at around £140 each, on top of that you've got new cables at around £45 each, new disks, pads and the custom brackets. All in all there's probably not going to be much change from £700 for the rear upgrade. If we can do the package with the 6 pots for the front off your other thread then that sounds good to me.